City Theme: Nature, Forest, Magical, unique shape. 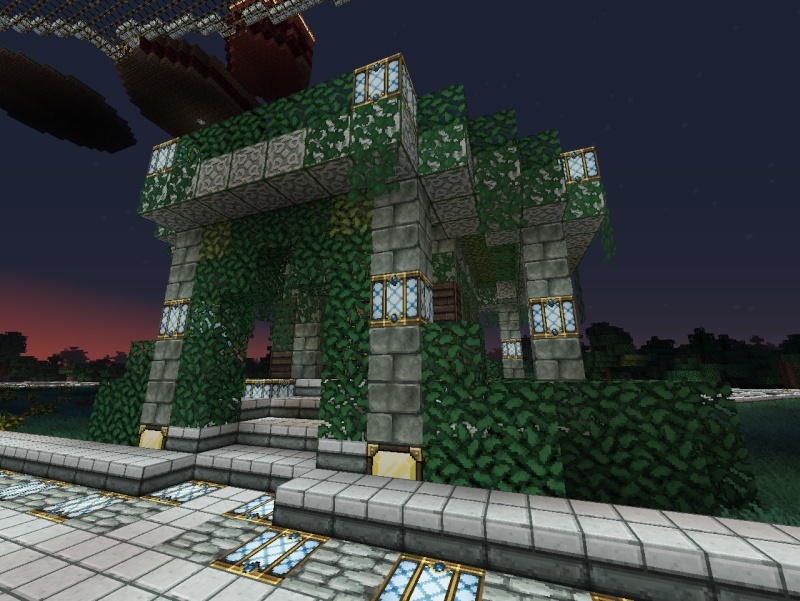 Public Areas: The Sky Ring, City Hall of Acheron, Acheron Mines, Shrine of Magic, SPManor Shop. Got any questions, complaints, suggestions or requests? PM NeroTheDarklord, Ryoman or me or post in this thread and let us know! These are the rules which the citizens of Acheron should take notice of! Rule 2: Building Height of 8. More detailed information can be found below! Rule 3: No ridiculous traps! If you want to protect something use /cprivate instead! Once you get banned you are also immidiately kicked out of Acheron, even when you get a 2nd chance! We don't like griefers in Acheron. Rule 6: Only cut trees outside the city! But if you cut them, LEAVE NO FLOATING CROWNS. Floating crowns just look ugly. Also for each cut tree please replant atleast 2 new ones! BREAKING THIS RULE WILL KICK YOU OUT OF ACHERON IMMIDIATELY WITHOUT WARNING OR DISCUSSING! IT MIGHT ALSO GET YOU BANNED SINCE THE OFFICIAL RULE FOR GRIEFING SAYS SO! Rule 7: Leave a sign above or next to your door saying "<name>'s Home" or "<name>'s shop". These were just simple examples, you can tweak it a bit of course. Rule 8: No Private Mines! I had some thoughts about the building heights. Some people said 8 might be a bit too low. So I thought of still leaving it 8 but that if you pay half the plot price AGAIN, you'll be granted with a building height limit of 16 (double of 8 ). Also I'll give anyone who got a plot at Acheron a basement depth of 4 giving you a total of 12 + 1 for floor between basement and the ground floor (or main floor however you may call it). 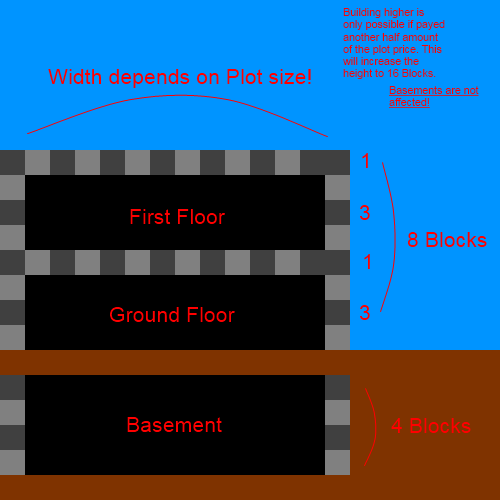 Here is a sketch which I made which shows a possible Building with the basic 8 blocks height limit, 2 floors wich are 3 blocks room height and the basement wich is 4 blocks high. If you got 2 Plots next to eachother but a street between it (wich is usual in Acheron) you are allowed to build a tunnel or a bridge to the other plot. The Tunnel needs to stay the same height as the basement maximum! The Bridge has to be atleast 4 blocks above the ground floor! REMEMBER: No private mines are allowed! List of People who are allowed to build 16 Blocks high. - Private Mine entrances allowed for you. - Entitled "Honored Citizen of Acheron". This title has been awarded to players which done a great job at supporting Acheron in things like donating for the transferring from the old map or donating a 30,000 Gil warp plot. You can still get this title if you for example donate me a stack of Diamonds or other very useful items or gil. Some Questions that occur quite often. Please try to avoid those since they already annoy us. Q: "Can you tp me to Acheron?" A: I'm starting to get sick of this question. My advertisements in-game already tell you to USE THE TP RUNE AT SPAWN! Q: "Ok, ok, but where is the TP Rune?" A: If you go down the stairs of the spawn tower, go through the exit directly in front of you. Not very far away from the exit is a sign which says something similar like "To Acheron, The Great City of Magic" with an arrow pointing left. Some shrine-like structure should be visible if you follow the arrow, that is the tp rune! Q: "I'm a donator and I would like to have a Private Warp in Acheron. Is that okay?" A: Of course. As long as you don't set it on a plot or inside a building which does not belong to you it's fine. Q: "What is the building height limit?" A: Regular Height is 8 blocks. You can double it of course. See "Information about building height"! Q: "What is the price of a 10x10 plot?" A: Are you serious? Have you ever been to Acheron before? The plots are not shaped in a quadratic way so there is no '10x10' plot. Anyway, the prices for regular building height can be seen on the signs on the plots. Q: "I'd like to reserve a plot, is that possible?" A: Mainly no. It gives us more work than we already have. But sometimes I allow you to reserve a plot. Q: "I own at least 2 sky plots next to each other. Am I allowed to connect the ground of these plots with dirt?" A: No, because this would count as violation of Rule 5. You are only allowed to build ON your plots. Expanding the plot is highly restricted! You can connect these plots with bridges that are connecting the roofs though. The FAQs will be expanded. The Shrine of Magic is a new Public place in Acheron, it is a public Enchantment Table with loads of books around it for high lvl enchantments too. I know this is a double post, but this is an important change to Acheron.